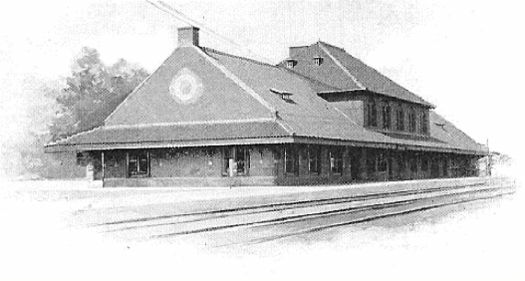 The design of the Fargo Depot is based on a typical railroad depot plan that calls for the central portion of the building to be two stories with flanking single-story wings. Most small depots were designed in Richardsonian, Stick, or Queen Anne styles. Here, the Italian Renaissance and the Romanesque are Gilbert's inspiration. The exterior walls are of brown pressed brick with red Lake Superior sandstone trim. Most notable are the paired arched windows surmounted by a circular window inset within a greater arch, a window design Gilbert had used previously on the top floor of the T.L. Blood & Company Warehouse (1893-1895), the Gotzian Office Building (1895), and the Northern Pacific Office Building (1896), all in Saint Paul. It was also similar to an unbuilt office building that Gilbert had designed for O.G. Clay. 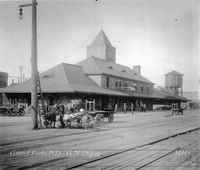 From 1896 until the turn of the twentieth century, Gilbert had an ongoing relationship with the Northern Pacific Railroad. That would change when new management took over and Gilbert relocated to New York. Reed & Stem would replace Gilbert as the railroad's architect. National Register of Historic Places, Nomination Form for Fargo Northern Pacific Railroad Station (1975) Text: http://pdfhost.focus.nps.gov/docs/NRHP/Text/75001304.pdf (PDF), Photos: http://pdfhost.focus.nps.gov/docs/NRHP/Photos/75001304.pdf (PDF).